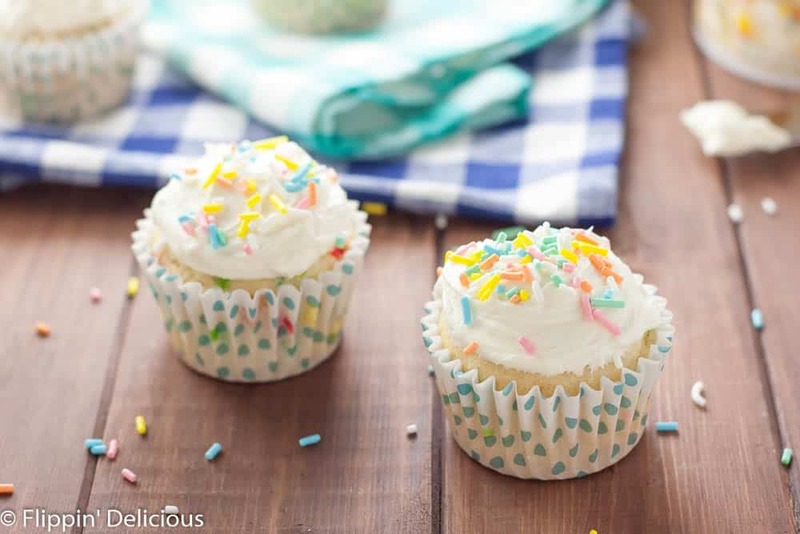 Celebrate with these easy Gluten Free Funfetti Cupcakes with GF Cake Batter Frosting! There are many reasons to love cake, but one of my favorites is family celebrations! It really isn’t a party unless there is cake, right? And sprinkles. Gotta have sprinkles. I have 2 little girls now and boy do they keep my hands full! They both LOVE helping me in the kitchen. They fight over who gets to add each ingredient and anxiously (with yelling and pulling) wait for the other to finish their turn stirring. I have a hard enough time preventing the entire bowl of cake batter from spilling on the table, let alone trying to remember if I added 1 cup of sugar or 2. Because of my helpers I am so thankful that gluten-free cake mixes are so much more readily available now! Not only is it easier to bake and #MixUpAMoment with my kids, I also have more time to enjoy with them after our baking project is done. Using gluten free mixes makes baking with my girls enjoyable instead of stressful. That is especially awesome when we are getting ready to celebrate! Whether it is a barbecue with family, my daughter’s birthday, or just because it is Saturday, there are lots of spring occasions to celebrate. I do a little happy dance every time I use a cake mix! 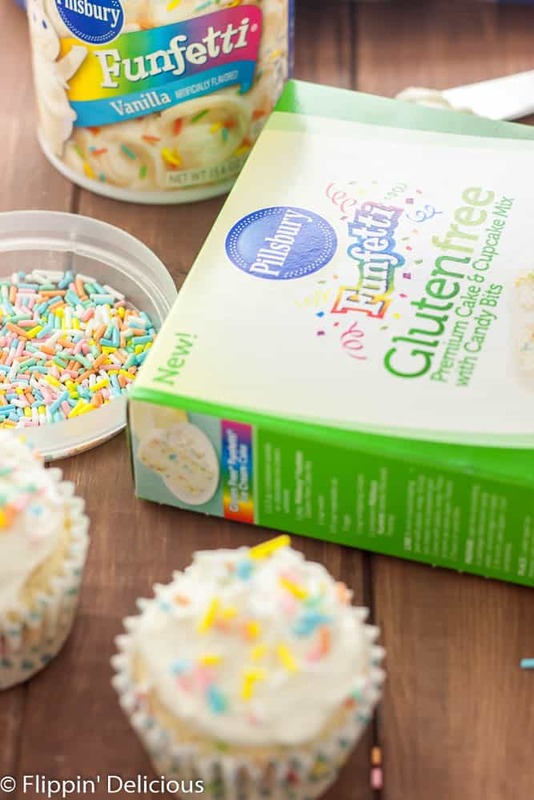 I first discovered that Pillsbury had a gluten-free cake mix last year when I was buying ingredients for my daughter’s 3rd birthday cake. 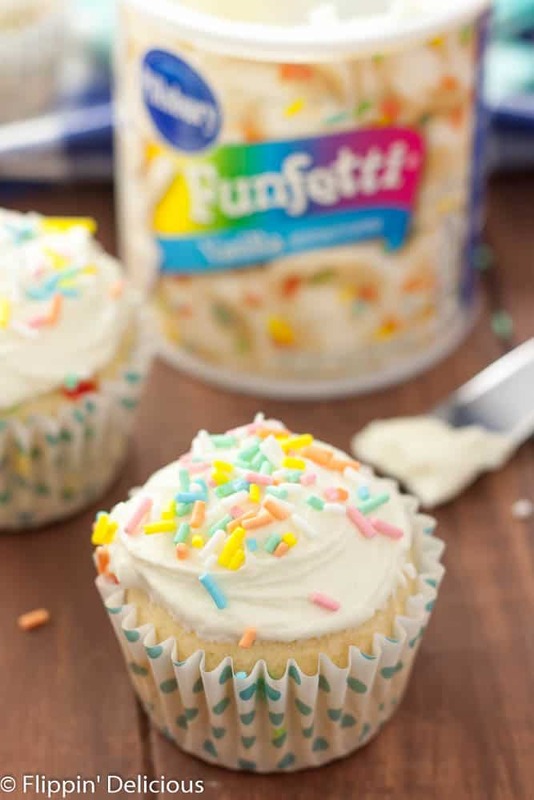 Pillsbury has a gluten free Funfetti Cake mix (who doesn’t love Funfetti!?!? ), gluten free yellow cake mix, and a gluten free devil’s food cake mix PLUS a line of cookie and brownie mixes. They are right on the baking aisle at my local Walmart with all the other cake mixes, Easy to find and inexpensive too! 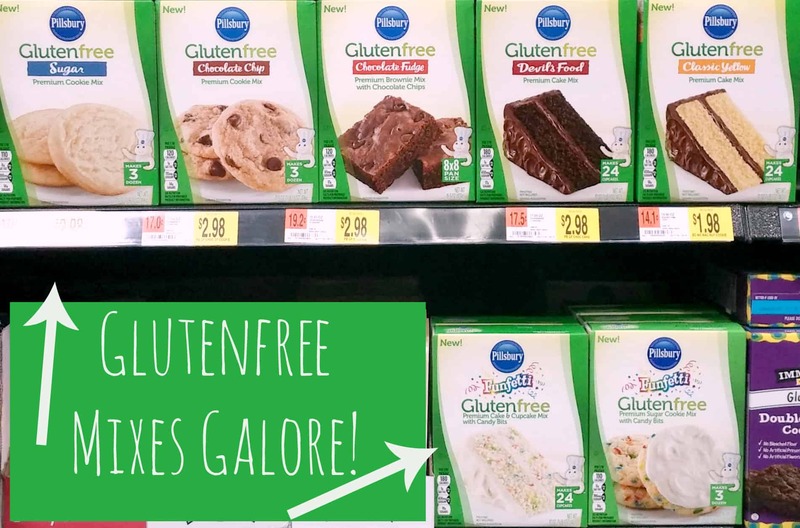 Also, just an FYI, all of Pillsbury’s frostings are gluten free too! 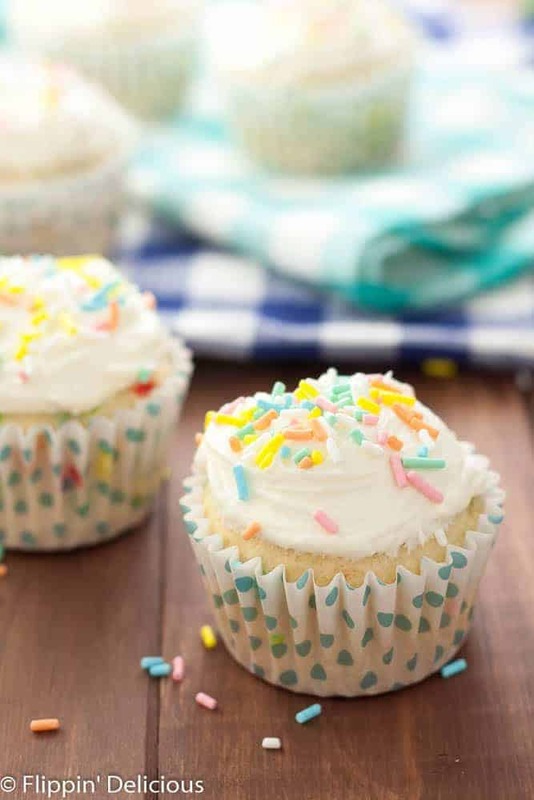 Even when I bake from a mix, I always add my own little twist which is exactly what I did when I baked these gluten free funfetti cupcakes with cake batter frosting for a spring bake sale. I saw a recipe for cake batter frosting from Sprinkles Bakes and I just had to make some myself! It is super simple, and I got rave reviews. Basically, you add some gluten free cake mix into your frosting and whip it up. I like adding more cake mix for a more cake-battery (that is a thing, right?) taste, but you can use less (OR MORE) to make it just how you like it. I baked up the rest of the cake mix to make more cupcakes, but you could also save it to make a quick gluten free funfetti mug cake whenever a craving hits you. + sprinkles and you are done! 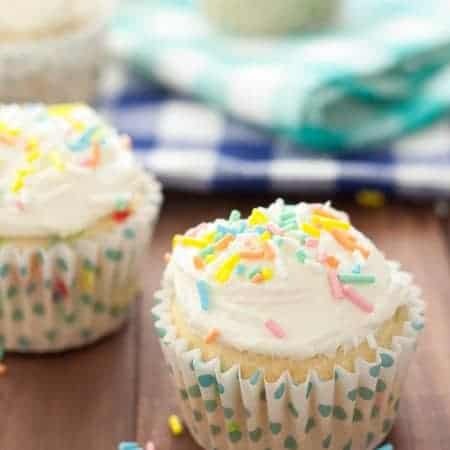 Gluten Free Funfetti Cupcakes with gluten free cake batter frosting. Easy to make with gluten free cake mix! Prepare one Pillsbury cake mix according to the package instructions and bake into cupcakes and cool. 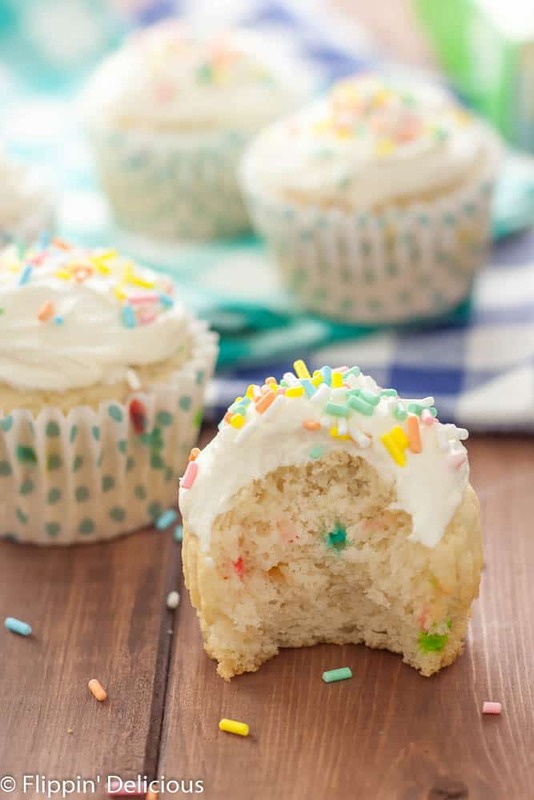 Scoop the Pillsbury Funfetti Frosting into a bowl, add ¼- 1/2 cup of Pillsbury Gluten Free Funfetti Cake Mix from the second box and whip with electric beaters until smooth. Frost the cupcakes with the cake batter frosting and decorate with the sprinkles that came with the Funfetti Frosting. You can save the remaining cake mix for making mug cakes whenever your sweet tooth has a craving, or you can bake it up. I removed approx ¾ cup of the mix (I made 2 containers of frosting to cover the extra cupcakes that I baked) and I used 2 eggs (instead of 3) and about ⅔ cup water and just less than ¼ cup oil. They baked up great! I don’t think there is a happier treat than Funfetti cupcakes! CLASSIC! I totally agree! Funfetti is the way to go! These are so pretty and fun! I bet the cake batter frosting is delicious. Thanks Emily! The Cake Batter frosting was da-bomb! Oh, yum. These look good! My sister in law and I were just talking about making Funfetti Cupcakes! I pointed her to your post. We’re going to make them for my nieces birthday. Thanks Chrystal! I hope your family loves them as much as mine did. I love Funfetti and these look delicious. So happy to have a gluten free option that’s easy to mix up in a flash again. Lovely! Thank you Lacy! It is so convenient, I just love having it as an option when things get crazy! Funfetti was my fav growing up! These look so amazing I am featuring them tomorrow on Savoring Saturdays. Can’t wait to see what you share this week!